Soil is not just dirt underneath your feet! Soil is a critical part of our life cycle. Soil is old. It takes hundreds and thousands of years to create an inch of topsoil! Topsoil is the richest layer of soil, one that is full of nutrients and minerals for growing plants. Dirt, made of inorganic materials like sand, silt, and clay, is actually dead. Soil, on the other hand, although partially mixed with dead dirt, is full of life! When you walk on soil you are walking on living matter!!! The parts of soil that are alive include bacteria and other living organisms such as worms and insects. These organisms work to break down material into nutrients that are the life-giving structure of soil. Roots from plants push into the soil creating passageways for water, air and nutrients. Earthworms, rodents, snakes and insects build subterranean passages that create additional routes for water, air and bacteria to move through the layers of soil. When you hold soil in your hand you are holding living, microscopic, bacteria! A teaspoon of soil is full of more kinds of bacteria and other micro- and macroscopic organisms than there are people living on earth! In fact, although we know about 6,000 species of bacteria, there are millions we haven’t yet discovered! Bacteria in soil are key to the health of the soil and the growth of plants. Healthy soil equals healthy insects, plants, birds, food…and people! Our life depends upon having healthy soil! Different climates, different organisms, and different topographic conditions create different types of soil. Deserts and rocky mountain areas have little soil. Warm, wet climates speed up the processes of decay and change, transforming Earth’s surface and once-living organisms into topsoil. Cool, dry climates work more slowly. 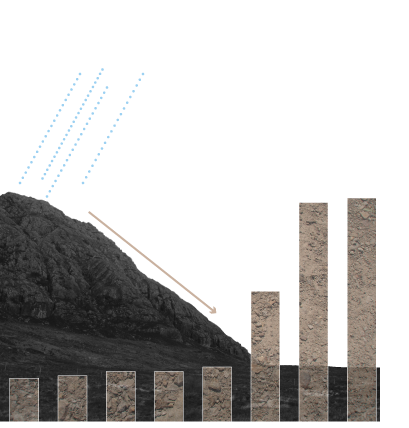 Steep topographic areas like mountains have less soil than flat areas. Wind and water wash away or ‘erode’ topsoil, while valleys act as collectors of soil. To compare different types of soil, get a few small containers, a large spoon, and an egg carton to sort any large items you find in the soil. Prepare one or two jars with rubber-banded, perforated covers for worms and insects. If possible, grab a magnifying glass. Go outside. Walk to different parts of your yard, a park, a forest, a lakefront or river’s edge. Collect soil from five different sources. Bring them in and begin to inspect them. Sort similar items from others. Put bugs together. Put worms together. Put rocks and stones and twigs together. Inspect the granules and other things you find. As you work, describe your soil samples in a notebook or field journal. You will see that soil is different in different places. Take pictures of your different soil collections. Describe your sampling site as either agricultural, garden, parkland, playing field, forest, open grassy field, shoreline, industrial, constructed, or wetland. Note the soil color. Check your library for the Munsell Soil Color Chart. Use several colored pencils to show the color of the soil. 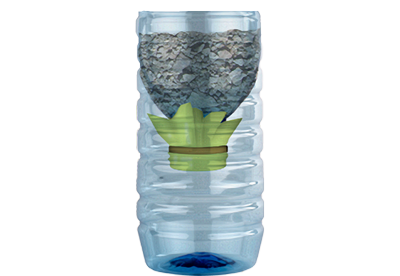 Begin to collect soil samples wherever you go! Now that you have collected and labeled different soil samples from different location, use several colored pencils to show the color of the soil. 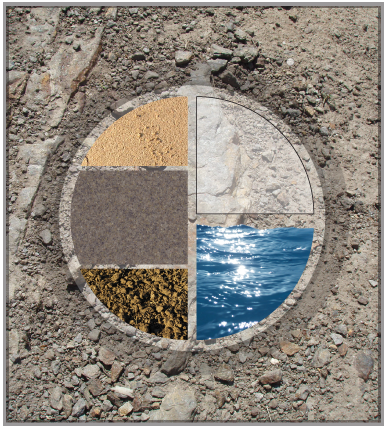 If you have access to a Munsell Soil Color System, find which color matches your soil samples. What does the color of the soil tell us? Look closely at your soil samples. 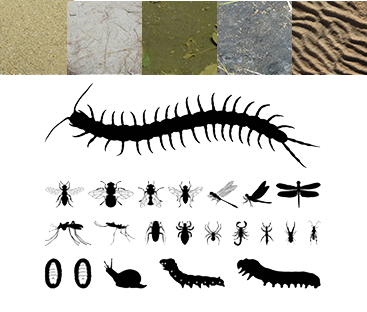 Did you find any of the following organisms in your samples? Worms? Beetles? Flies? Larvae? Snails? Slugs? Ants? Bees and wasps? Earwigs? Spiders? Centipede? Millipedes? Take a look at the Insect Journey and draw the organism found in each color of soil you have collected. Predict what will happen in each soil system. Then watch and record what happens as the solution passes through the soil. Observe the water that runs through and drips into the bottom of the bottles. Reflect on what is different in each of the soil systems and why. What did you discover? Plants need food (or nutrients) to grow. 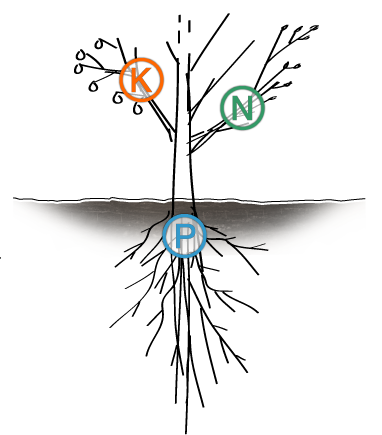 Plants need soil that has Nitrogen (N), Phosphorus (P), and Potash (K) to grow, just as we need food with vitamins, minerals, carbohydrates, and protein. Phosphorus is essential for healthy roots, seed and fruit development. Nitrogen creates green leaves, and Potash is essential for fruit and flower development. Plants require the correct pH level to access the Nitrogen, Phosphorus and Potash. Different plants require different pH levels so we test our soils to understand the pH level. If the pH level is too low (or acidic) we can enhance the soil with more nutrients. pH is measured on a scale of 1 to 14 with a measurement of 7.0 being neutral. A number below 7 is acidic (sour) and above 7 is alkaline (sweet). Most plants thrive between 6.2 and 7.2pH. If the soil is too acidic, the nutrients will be drained away as water flows through the soil. To reduce the acidity, you may mix in some lime. If the soil is too base or alkaline, or in other words, if there is not enough acid, then nutrients will not dissolve quickly enough to be taken up by plant roots. To reduce the alkalinity of soil, you can add some sulfur. To test the soil, you will need a Soil Testing Kit. Soil testing kits are available online or at your nearest hardware or gardening store. 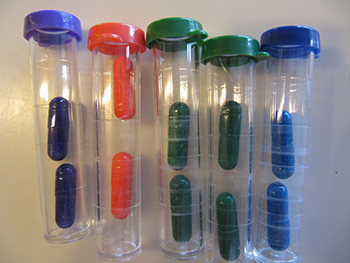 The simplest test has four glass tubes or vials with different colored lids and different colored tablets. While the best time to test your soil is in the spring before planting, or after the fall harvest, it is also important to test dry soil rather than wet unless it is part of a soil testing kit. Soil is made of organic and inorganic material, air and water. It is a living working system. Collect cotton balls, gravel, garden soil, and grass seed. 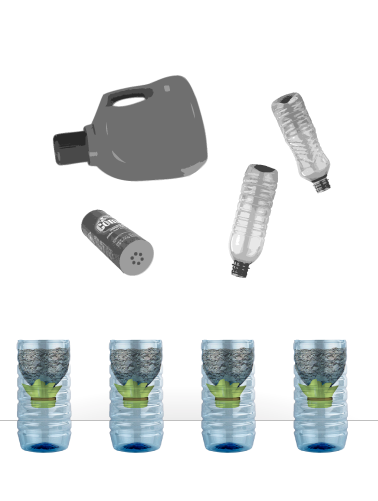 Collect one clear plastic liter bottle for each soil system. Cut the top1/3 off of one of the plastic liter bottles; remove the cap and turn the top upside down in the bottom. Place cotton balls in the bottom. These represent the spongy subsoil deep below the surface. Next place a layer of gravel as the stony layer. Cover the stony layer with a thin layer of moistened garden soil. Sprinkle grass seed and cover seed with ¼” soil. Place your soil system in a sunny windowsill. Keep the soil moist. Take a picture of your soil system each day until the grass is over 1 inch tall. You have replicated the layers of a soil system! Soil is essential to our health and well being. Which climatic regions produce the most soil?